Much to my surprise, just yesterday, I found it’s companion in a different charity shop and paid just £1.95 for the pleasure of owning it and re-uniting it with the one above. 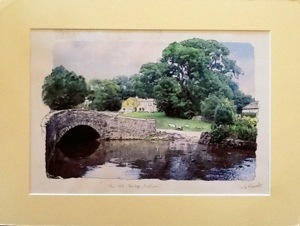 This one is called ‘The Old Bridge, Malham’ and is signed by K. A. Fosset (or perhaps Forrest). 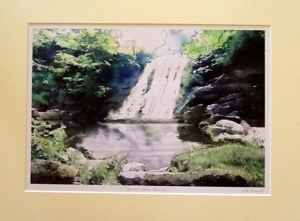 The artist is clearly talented and lives in or has a love for North Yorkshire, which is where Malham is situated. A link to more information on that area is below. It is a beautiful part of the world. So far we haven’t had luck in rehoming Janet’s Fosse but perhaps now there are two we will have. They are unframed so that could be the reason. I love them and for less than £5 for the pair they are worth every penny of a couple of frames.